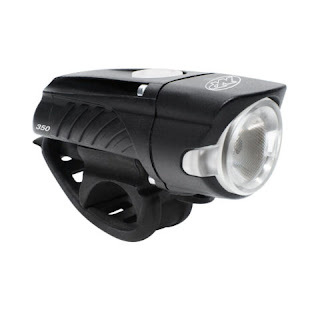 Our stocking stuffer and last-minute bicycling gift idea of the day is the NiteRider Swift 350 rechargeable headlight. At only $34.99, it takes away any excuses you may have still had to keep buying disposable batteries for your bike lights. Charge it in as little as 2 hours by plugging into any USB outlet, and get 90 minutes to over 21 hours of run time (depending on usage mode)! It's small and light enough (only 82 grams) to stash in your jersey pocket or bike bag for emergencies, but bright enough for road riding, bike paths, even mountain biking! Easy to take on and off your handlebars with the attached flexible strap. Daylight Visible Flash (DVF) mode for 24-hour safety! A dozen years ago, you would have paid 10 times this for a rechargeable headlight just as bright, and it would have been more than 10 times as heavy! Also available as a combo pack with the NiteRider Sabre 50 rechargeable taillight for only $59.99. Both in stock in all three Century Cycles stores!